If you want to prepare for the future of educational technology, start by exploring the past. 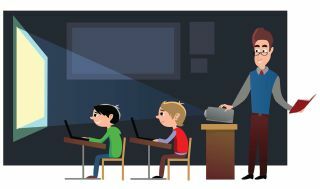 Look at the word “educate” and its Latin root educat; according to Merriam-Webster, the origin meant “led out.” If educate means to bring out rather than impose or give, how can audiovisual (AV) technologies help digitally savvy students make surprising connections or answer questions on their own? What are the AV trends that can help teachers draw insights from learners today and tomorrow? There is no shortage of projectors, microphones, and lecture capture devices available to school districts, but there is a crop of new AV products designed with the mission to support more engaging and active learning environments. Here is a sample of case studies that illustrate how AV can turn K-12 spaces into student-driven hubs. “The Role of Education in Building Soft Skills,” a Wainhouse Research K-12 report from 2015, revealed that problem-solving and collaborative skills are the primary soft skills on which schools should be focusing in the next decade. “Educators, parents, and students find that the benefits of a focus on collaboration are many, from encouraging active participation among learners to encouraging learners to take ownership of their education,” the Wainhouse Research analysts observed. As AI and automation seep into more of our daily tasks, it is creativity, emotional intelligence, and empathy that will give students and professionals the edge. Creating a framework for critical problem solving earlier rather than later is beneficial. Students in the Riverview High School in Canada and Pheasey Park Farm Primary School in UK worked together as if they were in the same room, thanks to the Nureva Span visual collaboration solution and the HDL300 audio conferencing system. A scene from the recent collaboration between 12th grade students at Riverview High School in Canada and 4th grade students in the UK. At the heart of the collaboration was interactive AV by Nureva. The emphasis on soft skills doesn’t demote the importance of curriculum fundamentals like reading, writing, and arithmetic. New AV technologies, such as the ClickShare wireless presentation systems from Barco and wePresent, huddle systems from Mersive, Crestron, and Harman, and interactive displays from the likes of InFocus, Nureva, Google, Cisco, and Avocor, put more power in the hands of learners. Instructional designers and teachers are playing ever important roles as they design syllabi and curricula enriched with technology that puts school district learning objectives first. Reading about Paleolithic cave art is one thing, but touring it in 360-degree video, with the ability to pan, tilt, and zoom in on a brushstroke is another. The latest iterations of 360 video, interactive whiteboards with high-touch functions, and laser projectors are giving K-12 teachers and technology directors more and brighter ways to inspire and empower students. At the Castleberry Independent School District (ISD) in Texas, multi-touch interactive displays are supporting pedagogy. At the Castleberry Independent School District (ISD) in Fort Worth, Texas, multi-touch interactive displays are supporting rigorous and engaging pedagogy. Containing seven campuses with three elementary schools, a middle school, a high school, an alternative school, and a learning center, Castleberry ISD is an educational leader that is committed to supporting “lifelong learning” in a diverse, changing world, according to the school. Advanced technology is integral to the school’s mission as it enables collaboration and interactivity. The school district’s IT department regularly evaluates its technology to ensure that it is meeting the highest standards set forth in the district’s technology vision. Most recently, this included replacing older whiteboards and failing projectors in the ISD’s three elementary schools with new BenQ RP653 Interactive Flat Panels (IFPs). The results have been compelling. The ISD’s IT team replaced older whiteboards with new BenQ RP653 Interactive Flat Panels (IFPs). Jacob Bowser, IT operations manager for Castleberry ISD, explained that the new BenQ system is easy to use for both teachers and students. “When training our teachers around new technology, they do an incredible job of incorporating it into their classrooms,” he said in a release. “It becomes an integral part of their lessons, so it’s essential everything is always up and running.” With the RP653 IFPs, guesswork is eliminated. Additionally, the system’s 20-point multi-touch interface allows multiple students to work side by side at the 65-inch screen. Learners can simultaneously touch the screen with virtually no delay in response. Beaver Acres Elementary School teacher Heather Hoxie is using 1:1 devices and the InFocus JTouch Interactive Display to individualize class instruction. Another inspiring example of interactive display technology in K-12 is in Beaverton, Oregon. Recipient of “Future Ready” and “Positive Change” grants, Beaver Acres Elementary School teacher Heather Hoxie is using one-to-one (1:1) devices and an interactive touch display to individualize class instruction. Hoxie replaced her classroom’s whiteboard with the InFocus JTouch Interactive Display. The display is bright enough to use at any time, even with all the classroom lights on. Each of her student’s individual devices is equipped with InFocus Lightcast software so they can wirelessly share or cast content to the JTouch for higher-level collaboration with no lag time or VGA cables. When the Optoma ZH420UST projector is combined with an Optoma Projected Capacitive Touch screen, multiple participants can interact with content. Interactive display solutions like the Microsoft Surface Hub and Google Jamboard are popular on the enterprise level; in K-12, affordability and scale are critically important. Interactive whiteboards that are easy to use, offer cloud access, and have more budget-friendly price points appeal to modern school districts that may want to standardize. The 4,000 lumen Optoma ZH420UST laser projector. While some AV integrators like Bryant-Cravens see interactive flat-panels on trend in K-12, the projection market has never been stronger. Just look at the new Optoma ZH420UST laser projector. This protean 1080p device incorporates a laser light source, 4,000 ANSI lumens, 100,000:1 contrast, and 0.25:1 ultra short-throw ratio. Warping adjustment and automatic edge blending are built in. When combined with an Optoma Projected Capacitive Touch (PCT) screen, multiple participants can interact with the content. The Plum Borough School District’s TV Production broadcast reaches the broader Pittsburgh region via community access channels and the school district’s YouTube channel. From a school play to a band concert, video streaming is helping broader communities connect with and support more student activities. Family and friends who cannot attend in person can feel the pride of graduation or the excitement of a production of “The Music Man” with Facebook Live, YouTube, or Periscope via smartphones. At the heart of professional-grade streaming systems are recording, encoding, decoding, and multi-platform distribution solutions. While these systems used to be relatively costly, they are becoming more affordable, they offer more automated features, and they are coming in more compact chassis designs. Students run the Make a Wish broadcast at the Plum Borough School District in Pennsylvania. A smart video broadcast and streaming solution is literally making dreams come true at the Plum Borough School District in Pennsylvania. Plum Borough runs the biggest school fundraiser for the Make-A-Wish Foundation, due in large part to its energetic, student-produced annual telethon. Plum Senior High School students produce the telethon under the direction of TV Production teacher Rick Berrott; the broadcast reaches the broader Pittsburgh region via community access channels and the school district’s YouTube channel. Plum Borough School District in Pennsylvania TV Production Teacher, Rick Berrott. 2018 is a banner year for artificial intelligence on the consumer level; some of the most notable offerings are Alexa, Echo, Invoke, and IBM Watson. Now there is Watson Assistant, a customizable voice assistant for potential to help classroom designers create systems that respond to individual commands or requirements for each room and/or instructor. They can also be automated and customized. While AI is increasingly present in AV and classrooms, the broader adoption of Augmented Reality (AR), Virtual Reality (VR), Mixed Reality (MR), and Internet of Things (IoT) in K-12 is not quite there yet, according to AVISPL’s Tracie Bryant-Cravens. “Most of AR and VR is leveraged today in higher education.” She believes that gamification is the “first step” for K-12 and Virtual Reality. In England, however, there are already exciting use cases of VR in K-12 environments. As NewBay editor Michael Garwood reported from the ed tech trade event BETT2018, “One of the most prominent and busiest stands at the show belonged to AVANTIS—a specialist in educational technology for over 20 years—who was showcasing the benefits of its ClassVR solution.” At St Wilfrid’s Academy in Blackburn, UK, the ClassVR portal is enabling teachers to see students’ VR headsets in real time, and deliver and shape VR experiences collaboratively with groups. Since studies show that 90 percent of people remember what they experience at far higher rates than what they hear, read, or see, experiences can help transform learning, from immersing a student in the trenches of World War I to marching in Selma for civil rights. The possibilities are endless. These “a-ha moments” have the potential to unfold in students’ minds long after the school year ends. After all, aren’t the most surprising discoveries the ones we make about ourselves? The mission of Parkland School District in Allentown, Pennsylvania, is to ensure that students are empowered with success strategies for lifelong learning. That’s why Robert Uhl, telecommunication specialist, has worked to fit eight of eleven schools with smart classrooms including Hitachi’s CP-TW2505 interactive projectors. Hitachi’s CP-TW2505 interactive projectors bring interactive content and video over IP to Parkland School District classrooms in Allentown, PA.
Parkland School District is made up of eleven schools including eight elementary schools, two middle schools and one high school and Uhl oversees the classroom and other AV equipment for the entire district. On top of the eight schools with smart classroom technology, Uhl also helps with the technology in the TV studios for the student-produced morning show and the digital signage used throughout the schools. The Hitachi CP-TW2505 enhances interactivity. Right now, Parkland School District has well over 200 Hitachi projectors including approximately 180 interactive and 30 standard projectors. This summer, Uhl is looking to complete the upgrade in the last three schools in the district. Margot Douaihy is the editor-at-large of AV Technology. She teaches and advises students at Franklin Pierce University in Rindge, New Hampshire. Are you a K-12 technologist needing to extend USB and HDMI in an economical way? Check out the Hall Research EX-HDU extender comprised of a single-gang Wall Plate Sender and compatible Receiver. The product uses only a single Cat5/6 cable to 200ft long. HDMI audio is extracted and is provided both as analog stereo and multi-channel digital. The Receiver can also be used to control other equipment by providing programmable contact closure I/O, RS-232 and IR outputs. Receivers with LAN connectivity are also available providing integrated user configurable WebGUI and IP control.